Until my retirement in 2008 I was head of history at Liverpool John Moores University. My interest in Stafford’s Irish families began in the 1980s when I lived in the town and began researching my family tree. My mother Olive Greenwood was born in Stafford in 1913. She worked as a tracer at the BRC and that’s where she met my father who had moved from Manchester with the firm in the 1920s. Her ancestors were all native Staffordians born and bred. 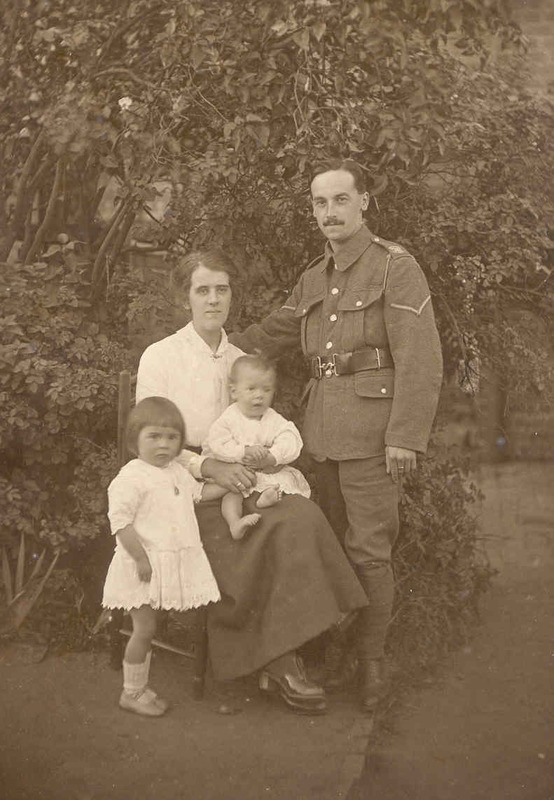 Here you can see her as a little girl with her father Frank Greenwood, her mother Mabel Moore and her brother Norman. The picture was taken in 1916 when Frank was serving on the Western Front with the Sherwood Foresters regiment. He later worked for the Staffordshire Education Department. For a time I thought I had an Irish ancestor. Frank’s mother was Clara Clewlow (b. 1863) and initially it looked like she was the daughter of James Charles Clewlow (b. 1832), a Stafford shoemaker, and Mary Corcoran (b. 1838), an Irish woman from Co. Roscommon. It subsequently turned out that Clara was the last child of James’s first wife, Mary Hodge from Bednall, so I have no Irish blood at all! By then, however, my interest in Stafford’s Irish families had been kindled. Both Frank Greenwood’s father and grandfather worked in the shoe trade. His grandfather, Henry Greenwood is the balding and bearded man in the middle of the back row on the next photo. 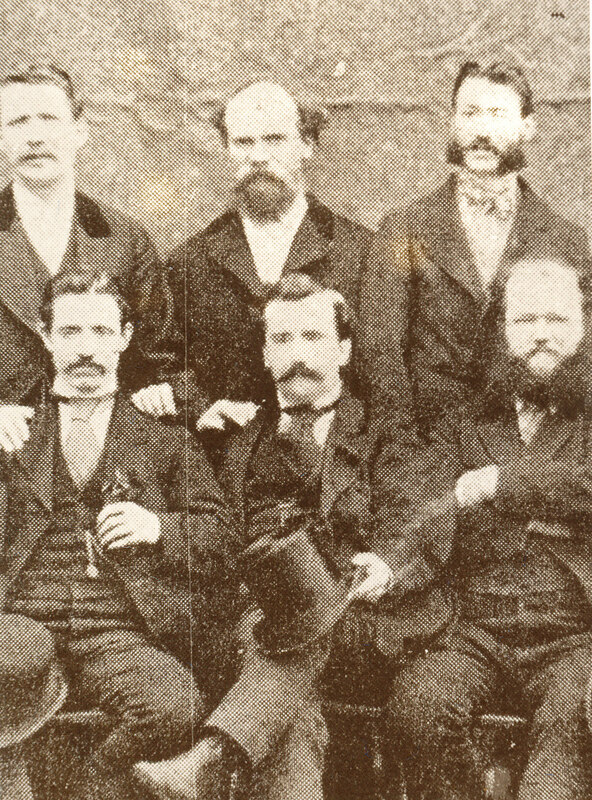 It was taken in 1874 when Henry was a Stafford delegate at the first conference of the National Union of Boot and Shoe Rivetters and Finishers. Family legend says he was ‘a bit of a rotter’. Mabel Moore’s family were also shoemakers. 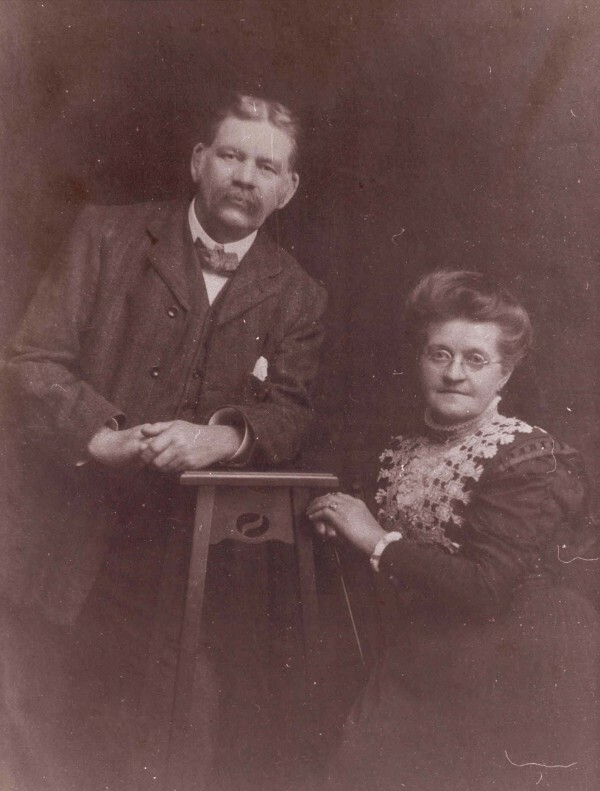 Her father was John Tranter Moore who you can see in the photo with his wife Sarah Hannah Hine. Sarah was born in Milford and had been a housemaid. John Tranter Moore’s father was Fred Moore (b. 1824), another shoemaker whose main claim to fame was singing in St Mary’s church choir for 77 years! All my male ancestors in Stafford were Stafford Burgesses ‘by birth’. My grandfather Frank Greenwood was sworn as a Burgess in 1912 and a hundred years later I discovered I had inherited from him the right to be a Freeman through my mother. In December 2013 it was with some pride that I was sworn as a Stafford Burgess 101 years after my grandfather. I read your website with great interest, it was recommended to me by a Patrick O’Sullivan who has been lecturing and writing about aspects of the Irish diaspora with particular reference to The West Riding Of Yorkshire (my synopsis is probably doing him a disservice for which I apologise). I am in the process of researching the lives of Irish women in Batley at the turn of the nineteenth century – the spur to this was a request from my son to write him a story for his 21st birthday! I come from an Irish family and was born in Batley. Whilst there seems to be a some literature about personal recollections, there seems to be little historiography, hence the research. I will soldier on and thank you for the inspiration your work has given me (I have just ordered a copy of “Divergent Paths”. Unfortunately, the above recreation is interfering with my reading towards a PhD (which will avoid the possibility of my falling into post-retirement atrophy). John, have ordered your book and look forward to reading it. I am doing my family tree and i am a descendant of the Corcoran Family from Cloonfad Tibohine. Dear Ann, Thanks for your contact. I’m really pleased to hear from another descendant of the Corcorans and, after you’ve looked at what I say about them in the book, I’d be grateful if you could let me know about any things I’ve got wrong and any further information you can give me. They were a very interesting family. I have only just come across your work on the Irish community in Stafford – it is v impressive. I have been researching my Irish family history for many years and hope to soon publish the findings. My gt gt grandfather Thomas Coyne came from Castlerea in Co Rosc’n where I note many of your families were from? We have no Stafford connection ( Lancs, espec. Manchester and Blackburn) but I saw you had a family called Coyne who arrived in 1855. I would be interested in any further info you may have. Many thanks for your comments and apologies for the delay in replying. I don’t have a lot of information on the Stafford Coyne family but James Coyne, a labourer, almost certainly came from Roscommon, as did his wife Catherine McDermott. They seem to have come to Stafford some time around 1852-5 – the first record is that their daughter Catherine was baptised at St Austin’s church on 28 September 1855. James worked as a farm or general labourer, but the family also kept a lodging house in Snow’s or Red Cow Yard from around 1874. James was fined on three occasions for breaking the regulations. James died in 1884 and his wife in 1891. They had three surviving children. Bridget (b. 1846) married Michael Burke in Stafford and they went on to have eleven children. There must be many descendants in and around Stafford. Edward (b. 1853) is last recorded working as a bricklayer’s labourer in Wolverhampton in 1901. Catherine (b. 1855) married a Thomas Fleming in Stafford in 1891 (Stafford, 6b41) but I have no subsequent record of their whereabouts. They didn’t live in Stafford and are not traceable in the 1901 census, so perhaps they emigrated during the 1890s. I hope that;s some help to you! Thanks John – this is much appreciated. If I come across any Stafford connections I will let you know. My maternal great grand mother was Susan Ellen Hamilton-Bowen. Would you have any information on the family? Daniel, I think you’ll have to give me a bit more information on what you know about this lady before I could help you. Is there a Stafford connection? I am researching a friends family tree. He is a descendent of the Clewlow/Corcoran family. I can’t find Mary Corcoran’s birth record, any info would be much appreciated. Frances, in general terms it seems Mary Corcoran was born in or around Castlerea, Co. Roscommon in about 1838. That seems to have been shortly after Patrick Corcoran and Catherine Crews moved to the vicinity of the town. However, like you I wasn’t able to find any record of her birth or baptism. The Catholic registers for Kilkeevin parish (NLI P.4619, Elphin Diocese, Kilkeevin Parish) are, frankly, chaotic and difficult to read. I have a note of three Corcoran baptisms in the 1830s, one of them a Mary, but I could not link that one to the Patrick and Catherine Corcoran who moved to Stafford. So I’m afraid I can’t be of much help except to point you in that direction – you may do better than me! I presume your friend is a descendant of Mary and James Charles Clewlow. If so, we may be related, if only by marriage, since I am a descendant of James and his first wife, Mary Hodge. I would be interested in any further information he/she could offer. Dear Roy, many thanks for the contact. I’d be very interested to hear what you know about your Manchester branch of the Giltraps, even if you can only go back to 1840. Do you think they are also descended from the same William Giltrap of Mullycagh, Co. Wicklow,as the Stafford branch? Have read your book here in Galway I find it interesting as my greatgrandfather John Suillivan is in the 1861 Census for Newcastle Under Lyme..in 1862 he married a Mary Darcy also from Oughterard area of Galway. The family are in Fletcher St in 1871 and 1881 Census..then they returned to Galway. But in 1870ies some of the Darcy’s went to the area..Chesterton and Silverdale…the descendants of these families still live in Staffordshire. One of my granduncle’s became a Borough Councillor for the Fenton area in the 1920ies. He ran a pub called the D’arcy Inn. It does seem that a lot of Connemara people did go to that area in the 19th century. I have traced a few and some came up in DNA matches. Nuala, how good to hear from you again! We last had contact in 2000 when you sent some very interesting information about your family. I’m pleased you’ve now read the book. Even though I don’t cover the Potteries area, the experiences between Stafford town and the Potteries for many of the Irish were often similar. As you say, many went from Connemara (and Galway/Roscommon/Mayo generally) to Staffordshire in the 19th century. John, I am a descendant of Thomas Hagan, who lived in Stafford at least from 1871 to 1901 – Sash Street, Red Lion Street and Grey Friars. I understand he came from Roscommon and was involved in a law suit when his wife died due to a doctor’s negligence. Do you have any information on his origin, and whether the Thomas Hagan (born about 1816) who lived in Stafford around 1900 was a relation. I enjoyed your book and am busy persuading all out family to buy copies! How good to hear from you, Peter. I have a certain amount of material on your family which I’ll send by email.